This week’s number in the real world is numbers which are affixed to a house or building and are part of an address (e.g., 123 Main Street). Thank goodness for these numbers – it would be hard to meet up at a designated location without them. The number in this picture: 2327. I chose this abandoned liquor store in an almost-abandoned town of Wyoming to illustrate street numbers because this building has an interesting story to tell. The story is one told many times before – the story of boom and bust. 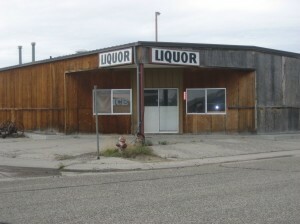 This liquor store is in the town of Jeffrey City which is about in the middle of Wyoming. 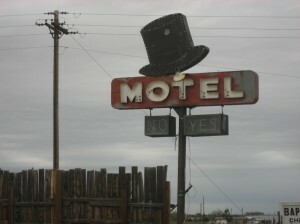 I’m sure the Top Hat Motel has lots of interesting stories to tell. Too bad I don’t know a one. And too bad someone bought this cool sign! So the sign, like most of the residents, will be gone for good from Jeffrey City. I drive through Jeffrey City a few times a year. So if you want to meet me in Jeffrey City, let’s meet at 2327 Sweetwater Blvd. We’ll shoot the breeze, chew the fat, and talk a good line. Don’t forget to BYOB. And as always, don’t forget to make this week count!